Recently I sat down and caught up with some of my favorite bloggers' latest posts and I am blown away by some very talented and amazing people out there! I find that when I come across someone who does exceptional work, it challenges and inspires me to work harder and keep trying even more. Then there are days when I work my way through three or four recipes and at the end of the day I start to wonder if I want to do this again but then a couple days later I am at it again and loving every moment it! While everyone else was making these treats weeks ago, I decided to make them now. Maybe next year I will be more in tune with the holidays. When I pick up a recipe like this, it amazes me how taking the ever so familiar ingredients and simply using a different technique for combining them can result in so many different foods! I like to compare it to an artist painting, the simplicity of combing the same primary colors resulting in a colorful work so stunning it makes you stare in wonder. The combinations for filling these are endless and I chose to start with something simple in order to get a good idea of what this cookie is all about. I have to admit that I thoroughly enjoyed making the triangles themselves, its so unique and pretty! Enjoy! Whisk together the flour, baking powder and salt together in a medium bowl. In a larger bowl combine orange juice, oil, sugar, eggs, vanilla and zest. Gently add the flour mixture to the wet ingredient and stir until the dough starts to come together. Turn mixture out onto a lightly floured work surface and knead a few time until the dough forms a smooth ball. Divide the dough into half and form two flat disks. Wrap each half in plastic wrap and refrigerate anywhere from 3 hours to overnight. Heat your oven to 350 degrees and line 2 baking sheets with parchment. Remove half of the dough from the refrigerator (leaving the other half wrapped and chilled) and roll it out to about a 1/8-in/4-mm thickness. Using a 2 1/2 - 3-in cookie cutter cut out as many circles as possible. 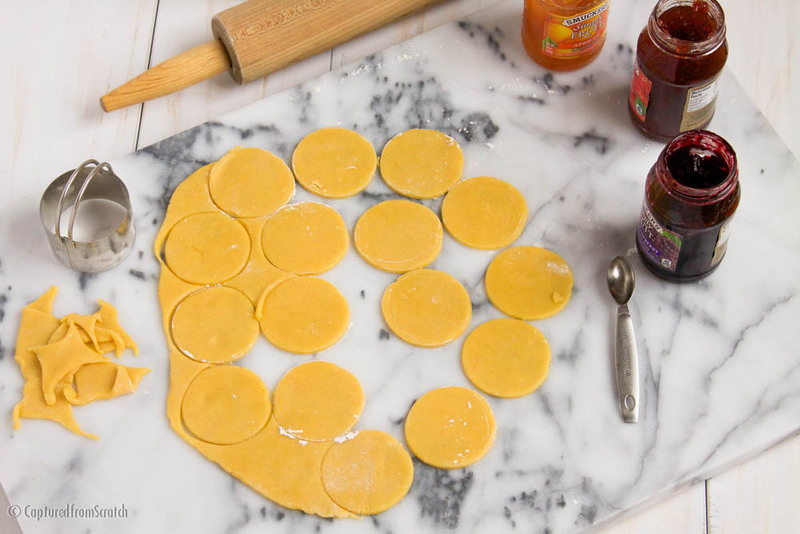 Remove the excess dough scraps so that you can afterwards re-roll and cut out additional circles. Spoon about 1/2 -1 tsp of fruit filling onto each circle of dough and then taking the edges of the dough, pinch together three seems halfway up to create the triangle. Continue the same steps with all the remaining dough. Transfer the prepared triangles onto the baking sheet and bake for 15-18 minutes until the seems start to turn golden in color. Allow to cool on a wire rack completely before serving. Cookies can be stored for up to three days in an airtight container.